Good morning friends. Grab some coffee or tea and have a seat. I have something very sweet to share with you. I first met the very sweet Kerry Goulder on Instagram. A wonderful community of crafters and just plain cool people with inspiration coming through an iphone app all day long. 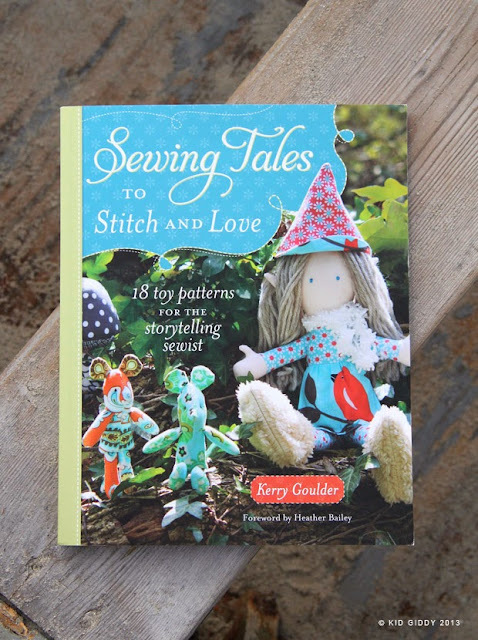 When Kerry shared her book with me "Sewing Tales to stitch and love" it instantly made me feel like a kid. I wanted to "sew all the things". 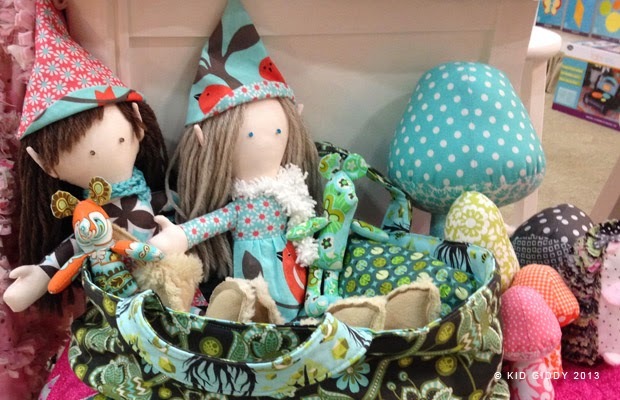 Kerry has put together 18 cute little projects for you to make that will inspire your creativity and bring out that kid in you. With clear steps and beautiful photos throughout the book. When you first open the book you are greeted with a foreword written by Heather Bailey, as well as a story set up written by Kerry. It definitely sets the mood of the book and gives it that sweet little taste of imagination. 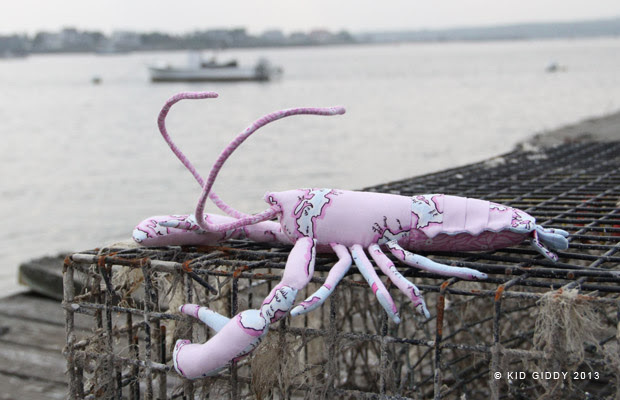 My absolute favorite is the cute little lobster. Isn't he cute? Or check these cuties out below. This book will give you directions to make your own little stuffies that are guaranteed to keep you young. Kerry, and the sponsors Fairfield, Dritz, Fiskars, Bosal, and Free Spirit. 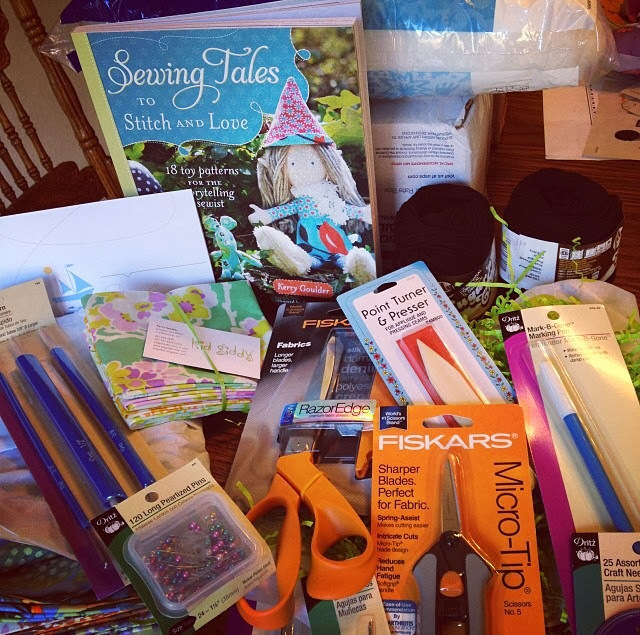 Sent me an amazing box filled with everything needed to make something from the book. All wrapped up in a pretty little package was some pretty neat stuff. Some useful items that I had never seen before. 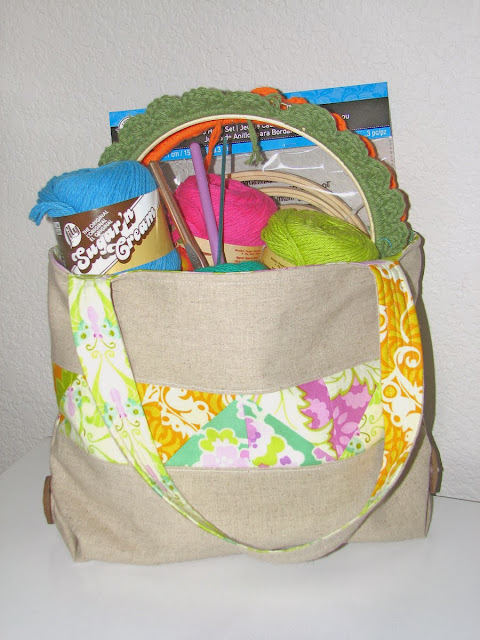 Being that crochet has had a little warm spot in my heart this fall again, I made the ready sew and go tote bag. This bag was perfectly simple to make as well as customize it to my needs and taste. ... and my end result was just what I needed. I changed a few things like size and even added buttons, but Kerry has provided instructions to make 3 different sizes. Small, medium, and large. 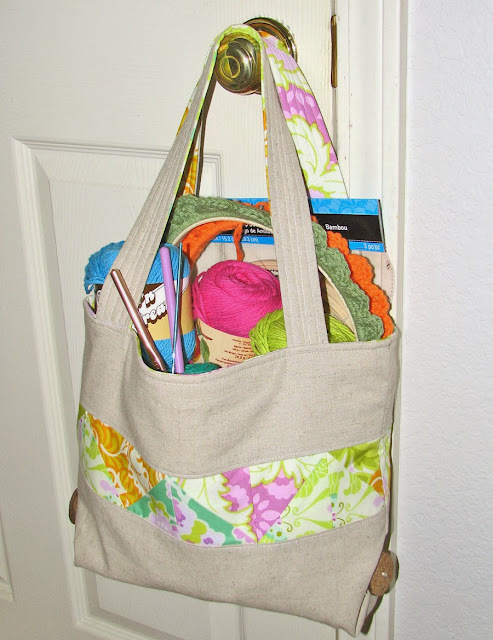 This is a great knitting, or sew on the go bag. Plus its way cute. So here is the best part! You want this book right? I have an autographed copy for one lucky reader. A huge thank you to Kerry, as well as all the sponsors for the amazing adventure this book gave both me and my little one. My favorite childhood memory is sewing with my dads mom and baking with my moms mom best of both worlds, I didn't know a blog-hop was going on so I would have to say I have enjoyed yours the best:) what keeps me young, my imagination by far and being able to create cute fun things everyday!!! My favorite childhood memory is walking with my grandpa in his garden eating fresh-picked radishes. My favorite childhood memory is lunch at the Grandparents on Wednesdays, playing with the rabbits and chickens in the backyard. One of my favorite memories as a child was spending time with my great-grandmother. She was part of our lives for a large part of my early childhood, which is a HUGE blessing. When we visited, I shared a room with her....and she always had a special stash of hershey kisses that only I knew about...I never told my brothers! And she taught me to play Dominos late into the night! My maternal grandfather lived with us after granny died - I remember him so well, he taught me to whistle!! Your bag is adorable! I love the fabric. One of my favorite childhood memories is when my grandmother first showed me how to crochet. I was probably 8 or 9. I made a weird, lopsided, brown "thing." I decided it was a bread basket. I gave it to my parents as a gift, and they used it as a bread basket for years. Well, well, well... I thought that the mouse was the cutest but your lobster has won me over completely!! I think it is the fabric you chose that makes it perfectly sweet!! As for your question... I think what keeps me young is being active and that means physically and mentally!! My favorite childhood memory was visiting my Mimi's house. I loved her old sewing maching with the wrought iron paddle on the bottoms. It was such fun to dig through the tiny drawers! 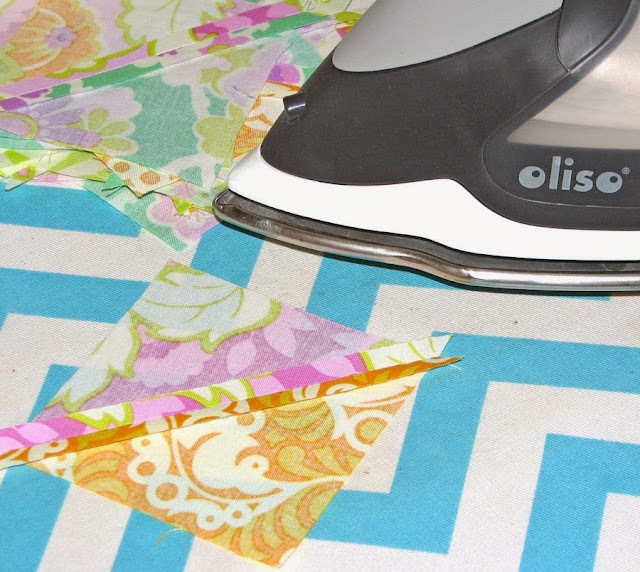 I love the fabric you used - so nice with the linen colour. My fav childhood memory - I would say getting a Crayola Caddy. All those crayons all perfectly colour organised in the turn table style holder - wow! I loved that thing!!!! My favourite childhood memory is Saturday afternoons with my grandfather watching black and white movies and listening to Jim Reeves. Very happy days. 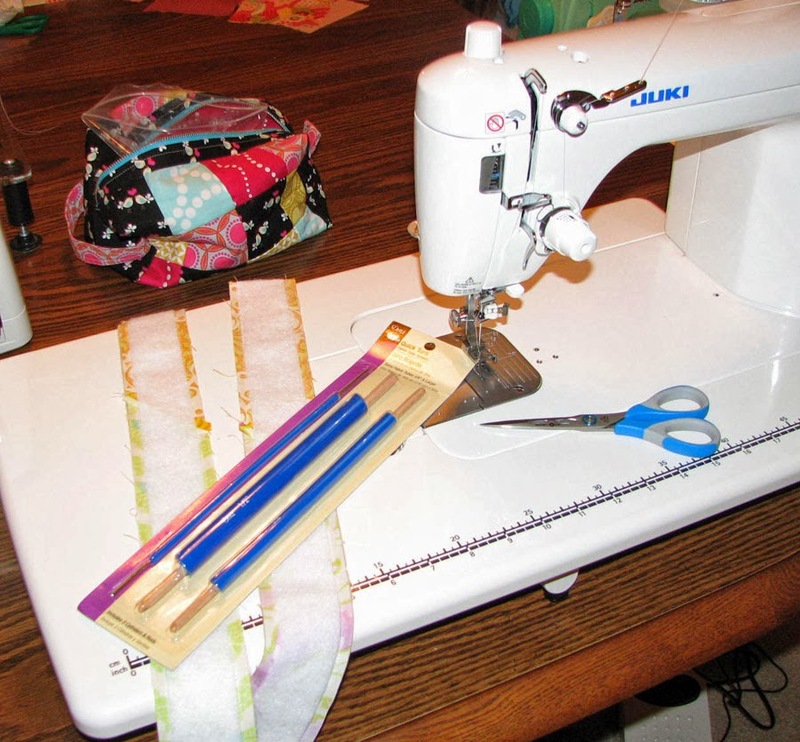 I don't think I could pick just one thing, but one of my favorites is when I learned to sew...I loved that I could make my own special gifts for everyone. My sweet father used a little zipper bag I made him for many years! Who knew almost 25 years later I would still be loving it! Your bag is super cute and love your fabrics choice!! One of my favorite childhood memories is spend Sundays with all the family with my grandmother. My favorite childhood memory is sewing with my great grandmother. thank you! My favorite childhood memory is of my Grannie- she would visit our home and make school clothes for me. She never had a pattern and eveyrthing fit. She always made the best doughnuts. My favorite childhood memories were little surprises. A spontaneous fishing trip with my dad, getting to stay home from school and do something fun, toys for no real reason. My favorite childhood memory is playing with my Barbies. My mom made all my Barbie clothes (she also sold homemade Barbie clothes) and I still have all of my Barbie collection. Thanks for the chance to win this really cute book. My memory of my maternal grandmother taking me shopping for books! she was the one who started me out ! Hello, What brings a smile to my face is the memory of me and my nephew, who's 6 months older than me, dancing out side in the rain. 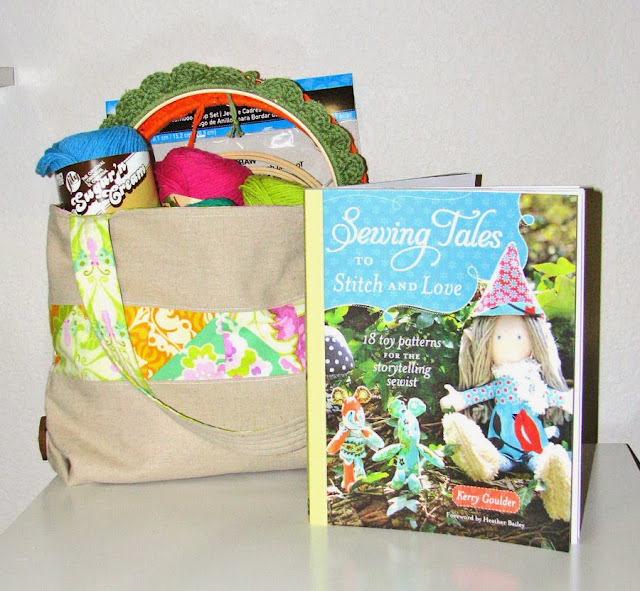 Favorite memory...sitting on my nana's lap in her rocking chair :), I have enjoyed every stop on this blog hop, this is such a wonderful book, and sewing keeps me young at heart! My Mom was the essential "Stay at Home " Farm wife. 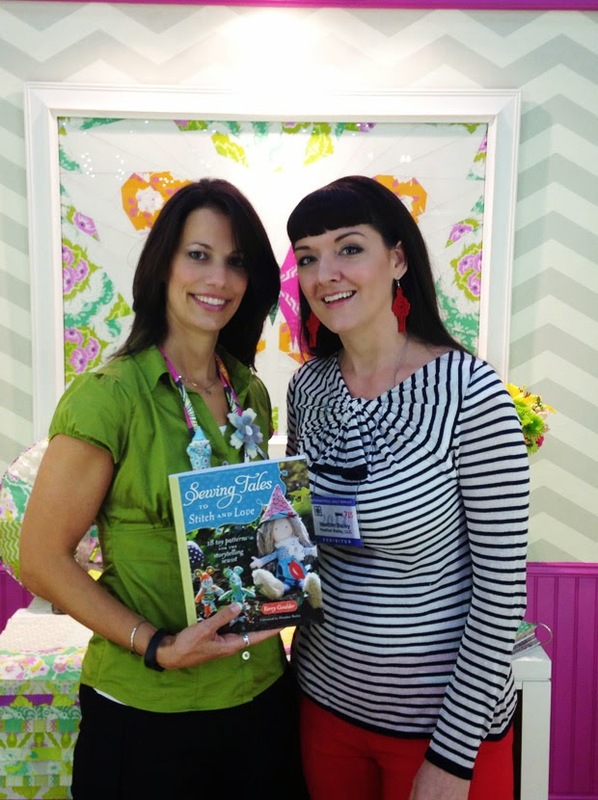 She taught me to sew, cook, bake and juggle home and family. I tried to continue all those traditions with my own family while working full time and running a home. Now thru our six grand daughters I try to pass on all these traits and teach them..............THEY keep me young in mind and heart. They don't let me forget all my MOm taught me and are eager to learn! My kids keep me young and make me feel old all at the same time. This book looks like fun! My Gran was my favourite part of my childhood, she always made me happy and cooked wonderful food. She also sewed and knitted all my dolls' clothes. Thanks for a fun giveaway. My kids keep me young forsure!! They have lots of energy so in order to keep up with them I have to take good care of my help by working out, eating right, and getting lots and lots of sleep which in turn also helps to keep me young! Many of my favorite childhood memories are of all the books I loved to read! And now getting to share them with my own little one is making them special all over again :-) Looks like a great book and thanks for the giveaway! 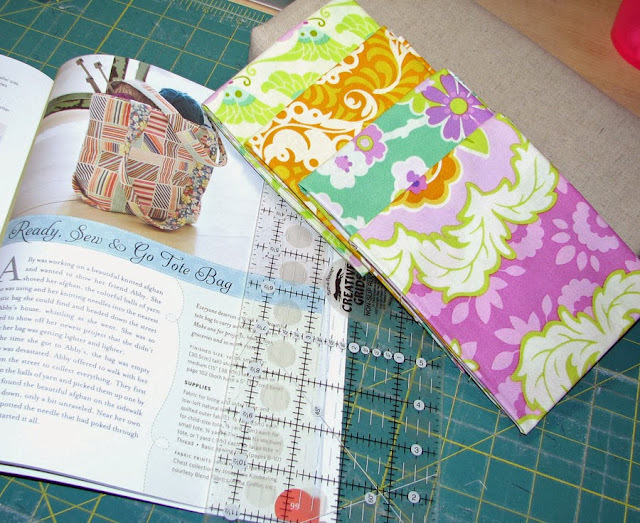 I am enjoying seeing all of the talented ladies making things from this book. It looks like a great book!